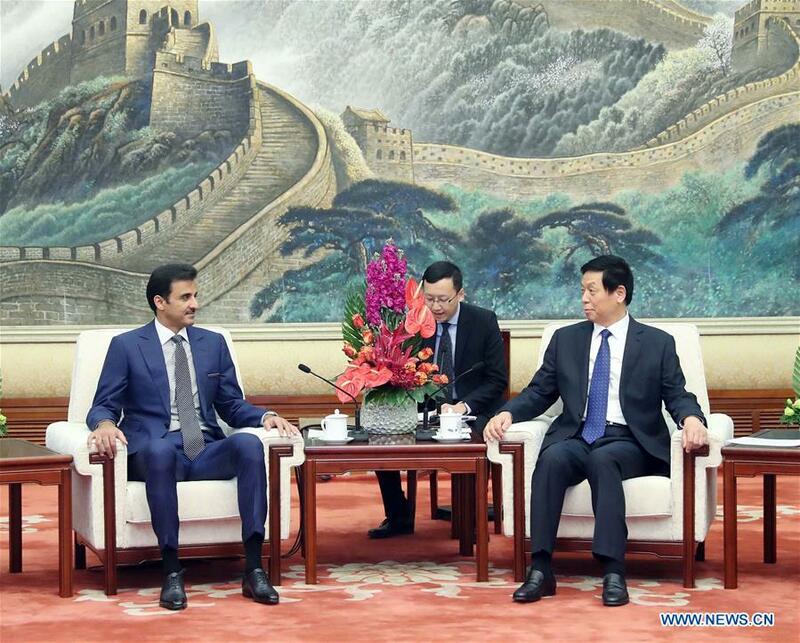 BEIJING, Jan. 31 (Xinhua) -- China's top legislator Li Zhanshu on Thursday met with Sheikh Tamim Bin Hamad al-Thani, emir of Qatar. Hailing the lifted ties between China and Qatar as a "strategic partnership," agreed by Chinese President Xi Jinping and Tamim in 2014, Li, chairman of the National People's Congress Standing Committee, pledged to implement the important consensus reached by the top leaders of the two countries and strengthen exchange of legislation experiences. He also called on the two sides to jointly promote the Belt and Road Initiative, and create a sound legal environment for cooperation in energy, infrastructure, investment and people-to-people exchanges. Qatar attaches importance to ties with China, Tamim said, vowing to promote cooperation in the Belt and Road Initiative, as well as areas such as trade, sports and tourism.